Is it Winter yet? It's certainly feeling like it with dark evenings and colder weather. Even though I'm not a lover of cold weather I do embrace it in some ways to make nights more cosy and relaxing. Aside from being obsessed with TV series I love to read and snuggle under a blanket. 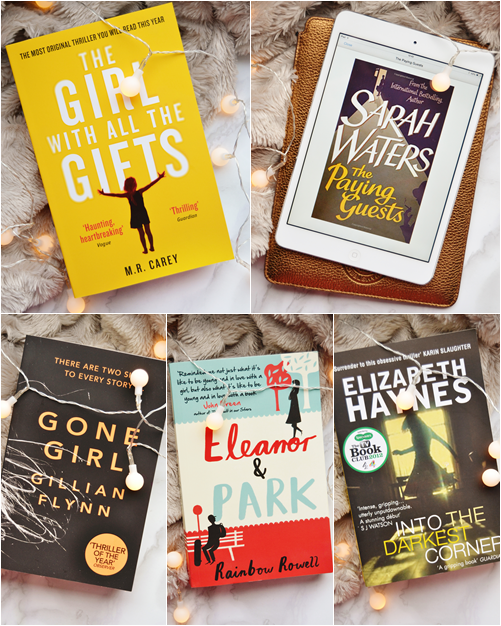 This year I've read many great books so I thought I'd share my favourites with you that I feel best suit this time of year that will really draw you in. Below are a mix of genres all with different elements of suspense that I'm sure most people will love! 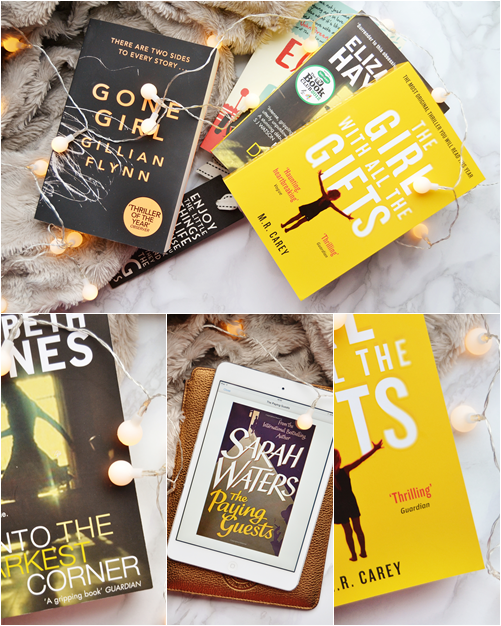 The Girl With All The Gifts was my latest read and one I went into without even knowing the genre or basic plot of - something I rarely do. But I'm glad I did! Which is why I don't want to give anything away here. All I will say is that this is a unique dystopian story with strong main characters and a plot to match. A book that will have you reading into the night. Sarah Waters is a favourite author of mine for being able to vividly take you back in time and submerge you in that era - generally the Victorian era. However The Paying Guests is set in the later time of the 1920s and tells the story of a mother and daughter forced into taking in lodgers to keep their once filled and happy home afloat. But of course little is as it seems as the daughter life takes some thrilling twists and turns. This is a story of love, crime and history. Expect to be submerged into 1920s London with this brilliant sapphic novel. Yes, it's in here; the book of 2014! With over 27 thousand reviews on Amazon and Gone Girl now being a major film I feel the world and it's dog know the basic plot by now. So I will spare you and jumped to what I loved about this book and why you should read it. Firstly this is plot twist central and will continuously have you guessing up until the last chapter. However be warned that you may not find any likable characters in this book that you root for! But a very thrilling read all the same. YA fiction here but one that isn't as squeaky clean as the cover may convey. On the outset this a typical boy-meets-girl novel but let me express how multi-layed this book is. From the unique setting of the 80's, to awkward teenage years and an unexpected twist of broken home lives. With strong believable characters this is such an enjoyable read that pulls you straight back to first relationships and how electric and awkward both physical and mental contact can be. One to read if you love emotional YA fiction or just want to fall in love with a book. Fact: I got book hangover after finishing this! Telling the story of Catherine in two separate time frames we see a once outgoing and happy woman turn into a supressed terrified victim at the hands of her boyfriend, Lee. With a truly believable narrative this isn't one for the faint hearted (I found it very tough to read in parts) as Into The Darkest Corner deals with matters of domestic violence and OCD, with some utterly heartwrenching and scary scenes. If you like gritty reads then you will love this!